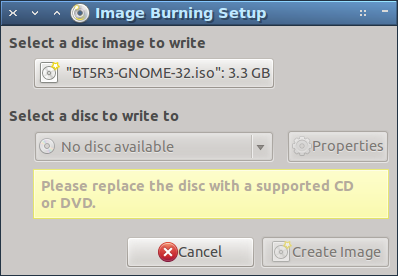 I have downloaded the Backtrack 5 R3 ISO (also an Ubuntu Studio 12.10/Ubuntu 12.10 ISOs) and I would like to burn it to a disk (4.7GB DVD-ROM I have) but I can't seem to get Ubuntu to recognize it. Startup Disk Creator/XFBurn don't recognize it, but they do allow me to load the ISOs into the program, just not burn it to a disk. For some reason, my drive will NOT recognize blank DVDs (don't as me why), I tested it in Windows and same problem. I will mark this as answer to close the question. Not the answer you're looking for? Browse other questions tagged iso burning backtrack or ask your own question. Windows 10 image too large for Brasero to burn. How can I get around this?